A third man has been charged in connection with the failed car bomb attacks in Glasgow and London. Dr Sabeel Ahmed, 26, of Liverpool, has been charged under the Terrorism Act with having information that could have prevented an act of terrorism. He will appear at City of Westminster Magistrates' Court in London on Monday. Earlier on Saturday Australian police charged doctor Mohammed Haneef with providing "reckless support" to a terrorist organisation. A major investigation has been under way in the UK since two cars containing petrol, gas cylinders and nails were discovered in central London on 29 June. They failed to explode. One day later, a burning car loaded with gas cylinders was driven into the main terminal building at Glasgow's international airport. Dr Sabeel Ahmed, an Indian-born doctor arrested on 30 June, is accused under Section 38(B) of the Terrorism Act 2000 that he had information which he "knew or believed may be of material assistance in preventing the commission by another of an act of terrorism". He is the third person to be charged over the attacks. 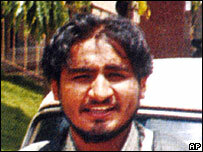 On 6 July Iraqi doctor Bilal Talal Samad Abdullah was charged with conspiracy to cause explosions. He was arrested at Glasgow Airport following the failed car bombing there. On Saturday Mohammed Haneef, a 27-year-old Indian doctor, was charged with providing "reckless support" to a terrorist organisation. The doctor, who has denied having any involvement in the alleged attacks, was stopped at Brisbane airport on 2 July as he tried to leave for India. He is alleged to have provided the mobile phone SIM card to his second cousins Sabeel and Kafeel Ahmed. Officers are continuing to question three more men at London's high-security Paddington Green police station. Dr Mohammed Asha, 26, of Newcastle-under-Lyme, Staffordshire, was arrested on the M6 motorway in Cheshire on 30 June. On Saturday police were granted a further seven days to question him. Police are also holding two trainee doctors aged 25 and 28, who were arrested at the Royal Alexandra Hospital, in Paisley, near Glasgow. The two trainee doctors can be held until Sunday. In addition, Kafeel Ahmed, 27, who was arrested after the attack at Glasgow's international airport, is still in hospital under police guard. Who are the car bomb suspects?